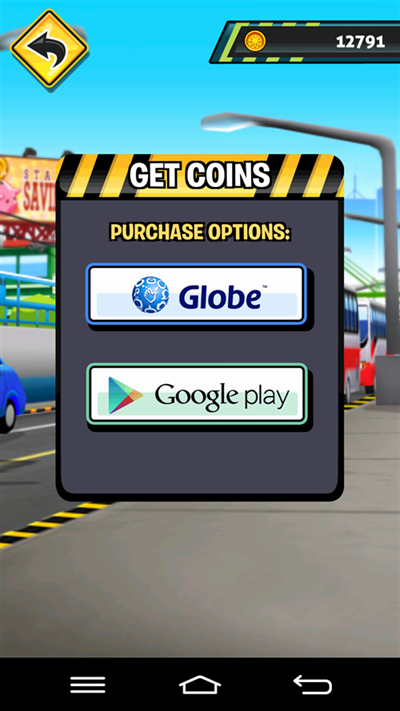 Globe subscribers can now make in-app purchases using their own load. Another first in the local industry, you can buy a variety of items directly within their Android mobile phone application using either Globe prepaid or postpaid load. Starting with Manila Rush and Cherry Dots of Philippine pioneering development studio Anino Games, fans of the two new apps no longer need to own a credit card to purchase virtual goods, premium content, and subscriptions. Manila Rush has its main character Miguel run through streets of Manila as he races against the clock to reach work on time while Cherry Dots makes users look for and eliminate patterns from the board before time runs out. Both Manila Rush and Cherry Dots can be downloaded for free on Google Play and are pre-installed in all new smartphone releases of Filipino phone manufacturer Cherry Mobile. Anne Michelle Santos, Developer Relations Manager for Globe Labs, meanwhile, encourages other developers to integrate the operating billing feature in their apps so that Globe smartphone customers can easily avail of the mobile in-apps. The amount spent would simply be deducted from their existing prepaid load or be charged to their postpaid account. "We are very excited to have the Globe Labs - Charging API (Application Programming Interface) for Android where it can help developers monetize and reach more users. We are also thankful to Anino Games for pioneering this in the Philippines. We are confident that this would inspire other developers to create free apps where they could earn as well using the easiest method available – mobile load credits," she said. "With more and more Filipinos switching to Smartphones, the time is just about right to start creating mobile games for the local market. We are excited to partner with Cherry Mobile in order to bring our games to more Filipino gamers. We also applaud the vision of Globe Telecom so that creating mobile games for the Philippine market becomes a win-win for both the telco and the developer," said Niel Dagondon, CEO of Anino Games. Richard Francisco, Head, Overseas Business Development of Cherry Mobile, adds: "Pinoys have always been game lovers. Who doesn't have memories of Mario? We at Cherry believe that collaboration with local developers such as Anino would allow everyone to access games that are more relevant to Pinoys not just in terms of content but also payment accessibility through the help of companies like Globe." A recent study done by mobile advertising firm Vserv showed that the Philippines has recorded the highest number of downloads of games and apps among Southeast Asian Countries with about 78 percent having downloaded at least one app during the August 2013 research period. The situation augurs well for Filipino developers who now have a bigger chance to showcase their products and to monetize it.